Black Knight Severe Weather Superior Roof Repair is a solvent based asphalt sealing compound. Ideal for general use, it is especially designed for wet surfaces and poor weather conditions. Its gel consistency permits easy troweling even in cold weather. It will not slump or flow when applied to vertical surfaces. Exceeds CAN/CGSB 3.75. DAP Premium Polyurethane Roof & Flashing Sealant is a low modulus, one-part, moisture-curing, commercial grade sealant. It is specially formulated to provide a permanent, waterproof seal when filling gaps, joints and cracks in a variety of roof surfaces. This durable, high performance sealant offers superior adhesion to most substrates without the use of a primer. It remains permanently flexible to withstand up to 50% total joint movement when installed into a properly prepared joint. 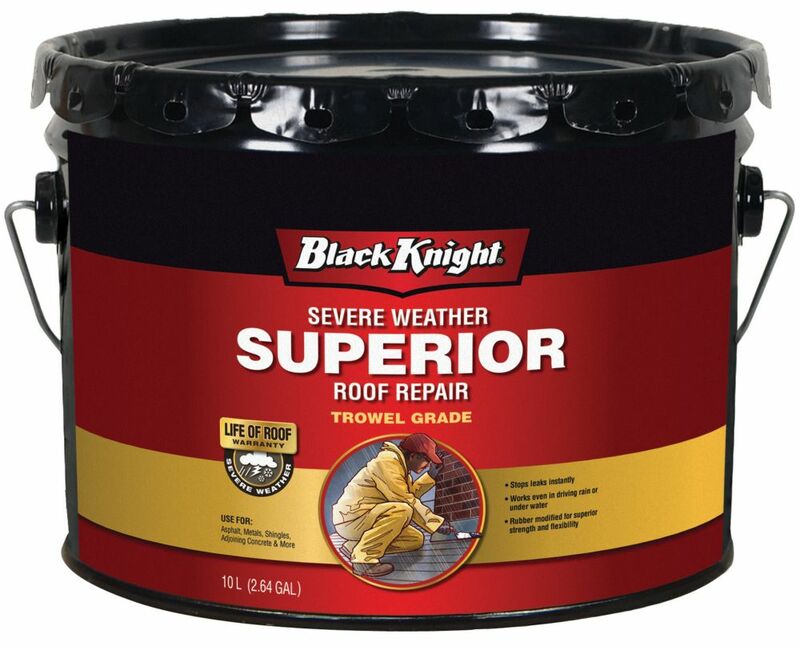 Severe Weather Superior Roof Repair 10L Black Knight Severe Weather Superior Roof Repair is a solvent based asphalt sealing compound. Ideal for general use, it is especially designed for wet surfaces and poor weather conditions. Its gel consistency permits easy troweling even in cold weather. It will not slump or flow when applied to vertical surfaces. Exceeds CAN/CGSB 3.75.